Learning about teamwork, friendship, generosity, and other cherished Filipino values gets even more fun and exciting as children’s show Jollitown gears up for its sixth season. 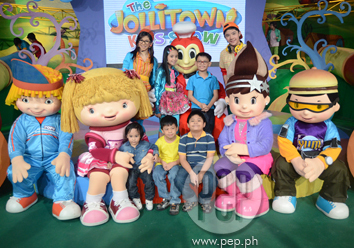 On July 20, the cool gang of Jollibee, Hetty, Twirlie, Yum, and Popo returns to TV with a promise of more fun storytelling, song and dance performances, and educational segments in The Jollitown Kids Show. Following a new taped-as-live and interactive format, three new characters bound to make the show more enjoyable and relatable will be introduced this season. They are Justin, Hannah, and Gabbie, played by young stars Renz Valerio, Anja Aguilar, and Amanda Lopez, respectively. The fun begins this Saturday, so kids and parents who are looking for a new weekend bonding activity better tune in to this 30-minute show that airs from 8:40 AM to 9:10 AM on GMA-7.